Today I’m talking with Michael Moss, who was awarded the Pulitzer Prize for explanatory reporting in 2010, and was a finalist for the prize in 2006 and 1999. 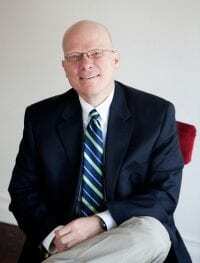 He is also the recipient of a Loeb Award and an Overseas Press Club citation. Before coming to the Times, he was a reporter for The Wall Street Journal, Newsday, and The Atlanta Journal-Constitution. I read his book, Salt Sugar Fat: How the Food Giants Hooked Us, in preparation for this interview and wish its contents could somehow be required reading for anyone who sets foot in a grocery store. More on that later…let’s get right to the questions. 1) What’s your latest book, Salt Sugar Fat, all about, and what are you hoping to accomplish with it? It’s an expose of the processed food industry, based on a trove of confidential documents that put me at the table of the largest food manufacturers as they are planning, plotting and formulating new products. 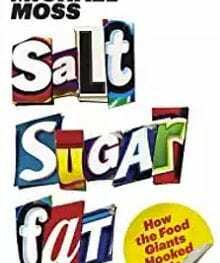 These documents, which I fully footnote in the book, in turn, enabled me to identify the key players in processed foods – scientists, marketers, CEOs – and convince them to talk to me and reveal even more secrets about their heavy dependence on salt, sugar and fat to maximize the allure of their products. I’m hoping the book is a wake-up call for the processed food industry, and at the same time empowering to consumers, in that simply knowing everything the companies are doing to compel consumption of their products is in itself a powerful tool in learning to shop and eat more healthily. Melanie Warner wondered how a piece of individually wrapped cheese could retain its shape, color, and texture for years. 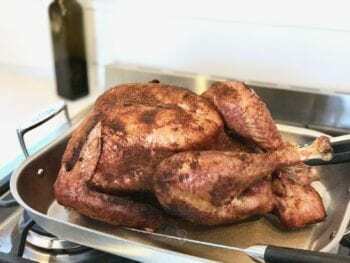 She started running this and other “food experiments” in her home, including chicken nuggets that turned to liquid mush, while simultaneously conducting research that took her to food science departments, research labs and factories around the country. 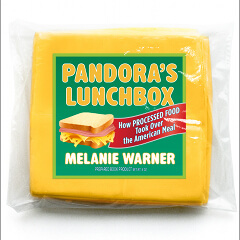 A mother and former New York Times business reporter, Melanie offers up a behind the scenes look at the processed food industry in her eye-opening new book, Pandora’s Lunchbox, which just so happens to contain an interview with one of our very own 10-Day Pledge graduates, Darcy Struckmeier and family! How cool is that? 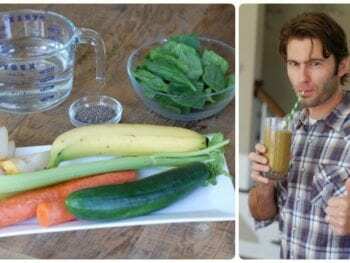 This is Part II of my interview with Robyn O’Brien – in Part I we discussed food allergies, diet and our food supply. And we are actually giving away 10 copies of Robyn’s book The Unhealthy Truth, which shares the story of “One Mother’s Shocking Investigation into the Dangers of America’s Food Supply – and What Every Family Can Do to Protect Itself.” It’s straight up non-fiction, but as Robyn reveals what she learns through her research it begins reading like a thriller (at least for someone like me who’s interested in food and my family’s health!). At the end of the interview you’ll see instructions for how to enter to win. Is your child one of the 33% who suffer from asthma, allergies, ADHD, or autism? If so, you will not want to miss this post today. Robyn O’Brien, a.k.a. “the Erin Brockovich of the food industry,” believes that our kids are the “canaries in the coal mine” and that the sudden rise of these childhood ailments, especially food allergies, might be a warning sign to all of us that something in our food system is very wrong. 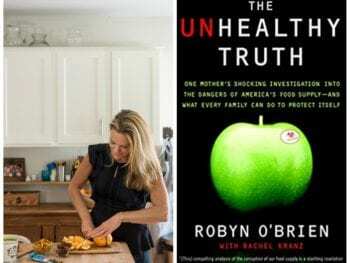 In her book The Unhealthy Truth, Robyn takes you along for the ride as her extensive research reveals “One Mother’s Shocking Investigation into the Dangers of America’s Food Supply – and What Every Family Can Do to Protect Itself.” I was on a flight when I hit chapter 3, which is when the pages really started flying (no pun intended, I swear). At one point my jaw dropped; later I let out an audible gasp. I found myself writing interview notes even though at that point in time I had no interview gig. Fast-forward to now, and here I am talking to Robyn O’Brien. Who knew?